This shimmery body wash and lotion set is the perfect gift for your bridal party. It is a nice way to say "thank you" for sharing in your special day. The Blushed Orchid fragrance is just the right touch of orchid and pear nectar giving these products a soft and subtle scent. LOTION: To a microwave-safe measuring cup, add 26 oz. of lotion base. Place in microwave and heat for about 1-2 minutes to thin lotion. In a plastic beaker, mix 0.45 oz. fragrance oil and 0.23 oz. Vanilla Color Stabilizer. Let sit for two minutes. Add 3 micro scoops of Rose Gold Mica Powder and mix into the fragrance mixture. 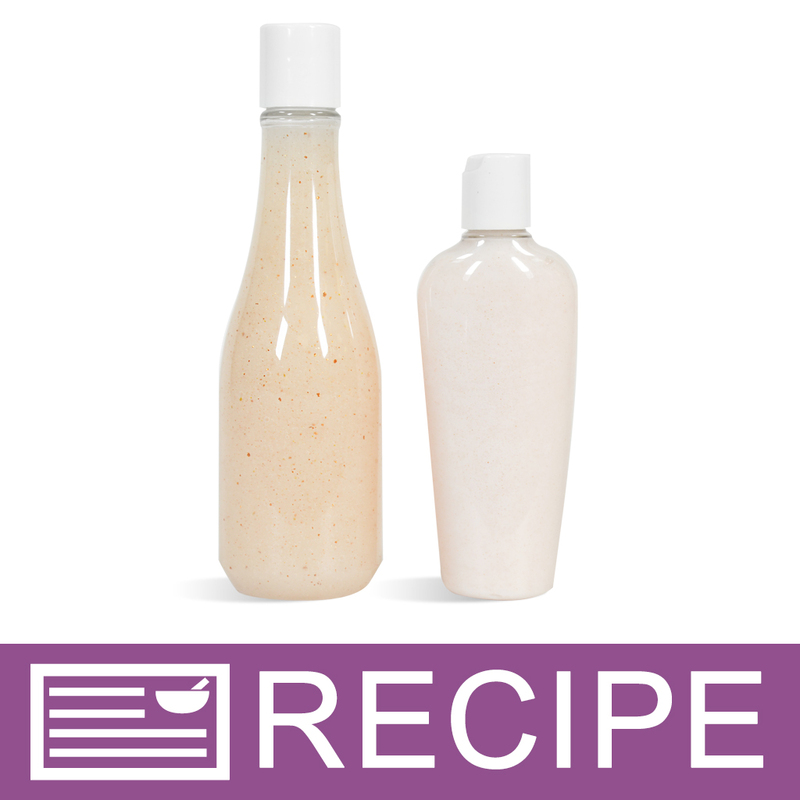 Pour colored liquid into the lotion and stir well to incorporate. Pour lotion into a Mix & Pour Funnel Pitcher to make it easier to pour into the bottles. Fill each 4 oz. bottle to 4.33 oz. by weight. Set aside. Repeat above steps to make remaining 6 bottles. Apply caps to bottles once lotion has completely cooled. To Use: Apply to skin as often as desired. BODY WASH: Empty 54 oz. of Liquid Suspension Soap Base into microwave-safe measuring cup. Heat in microwave for about 1-2 minutes. Add 0.75 oz. Bubble Wash Pearlizer and mix in well. In a plastic beaker mix 0.55 oz. fragrance oil with 0.28 oz. stabilizer. Let sit for two minutes. Add 3 micro scoops of Rose Gold Mica Powder and stir. Add fragrance/color solution to warmed soap base and stir well to incorporate ingredients. Fill each Keuka bottle to 8.65 oz. by weight. Any remaining product can be divided evenly. Set aside. Repeat steps 1-5 to fill remaining 6 bottles. Once product has completely cooled, apply caps. To Use: Massage onto wet skin. Rinse well with warm water. To Package: Place 1 lotion and 1 body wash into a cello bag with crinkle paper and tie with coordinating ribbon.